Feeling stressed and can’t stop fidgeting? The Nutty Toys squishy kitty-cats are here to save you! The 2 piece kawaii squishy cat set consists of one pink eared white kitten and one light grey kitten, both 2.2 inches in height. 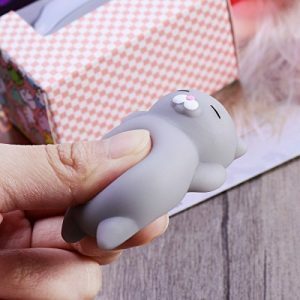 Made from premium silicone, the squishy cat toys come back to their initial form even when being squeezed or pinched repeatedly. Material is non-toxic and environmentally safe. Easy to care for, the toys can be washed with just water and soap, then after drying up sprinkled with talcum powder and they’ll be just like new. Multi-purpose toys for kids and adults alike. Makes a great gift idea for all age groups, from toddlers to teens and all the way to grown men and women. 100% Satisfaction Guarantee! Our mini mochi silicone cats are backed up by our manufacturer 30 day guarantee with a 2 year free replacement warranty. Click on the ADD TO CART button and adopt your very own squishy cats right now!